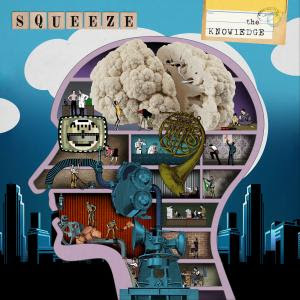 Squeeze pursue their excellent run started with “Cradle To The Grave” on this new offering. Louder Than War’s Craig Chaligne reviews. After dipping their toes back into the recording process in 2010 with an album of re-recordings of their most famous songs (“Spot The Difference”), Squeeze made a triumphant return in 2015 with “Cradle To The Grave”. The press was unanimous in saluting a fine return to form and a memorable appearance on the Andrew Marr Show proved to be the icing on the cake. Hot on the heels of “Cradle To The Grave” comes “The Knowledge” which manages to top its predecessor in term of song quality. It looks like the progressive approach to their return as a band started in 2007 is paying off with the songwriting partnership of Difford and Tilbrook firing on all cylinders, the two men repeatedly affirming in interviews that they have never felt as comfortable working with each other as in recent times. The elegiac “Innocence In Paradise” proves to be a perfect opener before we move to the delightful “Patchouli”, the kind of breezy song that the band excels at. Proving that their alteration of the lyrics to “Cradle To The Grave” on the Andrew Marr show wasn’t just an attempt at buzz, they manage to pull off with “A & E” a clever slice of social commentary coated in a soulful groove. “Every Story” sees Difford emulate Ray Davies lyrically while the rather grand intro to “A Rough Ride” morphs into a funky disco track with another set of great lyrics dedicated to the pitfalls of living in modern London. The ode to mid-life crisis “Please Be Upstanding” benefits from a great Tillbrook solo while the languid harmonies of “Final Score” hide another set of well craft lyrics on the difficult subject of child abuse. The band flexes their musical muscles on the instrumental “Elmers End” while the jaunty “Two Forks” sees theM revive their jaunty eighties sound, the song sounding like a distant cousin of “Hourglass”. The nostalgic vignette “Albatross” starts with a riff reminiscent of the Easybeats’s “Friday On My Mind”, the track could have been lifted straight of a sixties compilation. A very strong record that shows two songwriters a the top their game. The tracks on “The Knowledge” manage what every pop record should aspire too, mixing important subjects with great tunes. For further info on Squeeze you can check their official website: www.squeezeofficial.com. They are also on Facebook and Twitter. Brilliant Album,, I got it from Amazon,,, on vinyl,,, but the departure lounge , track, is faultly,,, it sticks,,,, Amazon sent me another, and that’s the same, so now ive got 2 copies to send back,,, but they give no address of how im supposed to send them back… I shall just go elsewhere and get it on CD,, I Shall if I can get it from Record shop in a nearby city….